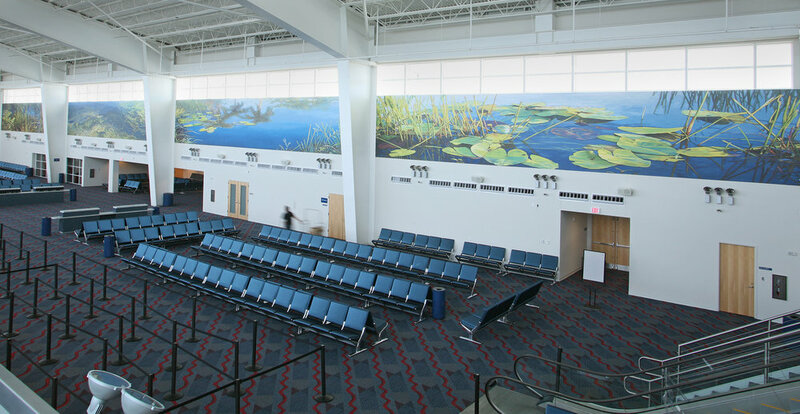 An installation honoring the Florida Everglades and Biscayne National Park placed throughout Terminal E at Dante B Fascell Port of Miami Airport baggage claim, 2007. Recognized by Americans for the Arts Public Art Year in Review 2007. Inspired by the hammocks, pinelands, wetlands, mangrove forests, flora, fauna and seashores of Miami-Dade County, the installation creates a journey for the traveler, transforming the entire terminal into an environment celebrating the native landscape of South Florida. The installation combines various materials, including digitally painted murals, hand painted glass tiles, hand cut glass mosaic, and etched glass. The juxtaposition of these various materials will create images that are stimulating visually and intellectually. 7.5' x 280' x 6"